Before the invention of the printing press, the only way you could obtain a copy of a written work was to copy it yourself or hire someone else to copy the manuscript. At the time, most of the written text available was religious in context, and it had been copied by scribes in monasteries. These books, which were labor intensive, were very expensive. Most historians agree that printing first developed in the Far East sometime around 700 AD. These first prints were usually fairly primitive and carved from a single block. Europeans first began printing in the 12th century. Not long afterward, the Koreans would become the first to invent movable type. The first scribes wrote on parchment, which was animal skin. A single copy of the Bible required 300 sheepskins or 100 calfskin. Eventually, the Chinese taught the Europeans how to turn wood pulp into paper. Printers would struggle to find an adequate ink until the 15th century. At this time, they learned that by mixing charcoal with linseed oil, it was possible to make a high quality, long lasting, ink. Movable type, where the letters could be manipulated arrived in Germany in 1420. It would be perfected by a man named Johannes Gutenberg, who was from the town of Mainz. Gutenberg turned the printing press into the first medium of mass communication that the world had ever known. Gutenberg made models of each letter in hard metal. Then with his models, he made molds of the letters. By pouring molten lead into the molds, he could make unlimited letters. Next, he placed the letters side by side in plates until an entire page had been constructed. Last the plates were covered in ink and pressed onto paper. This resulted in a neatly printed page. The first book printed in the Renaissance using this method was the Vulgate. Printed in 1456, today it is better known as the Gutenberg Bible. This version, is believed to be written by St. Jerome, towards the end of the 4th century. At the time, St. Jerome's version was the most commonly used Bible. It featured Gothic script, which was made to look like the hand writing that had been produced by the monks. Johannes Gutenberg called his new method of printing, “artificial writing.” The Bible itself was enormous. Its two volumes were 1282 pages in length, and Gutenberg needed over 1 million pieces of moveable type. Some of the Bibles were written on vellum, which was a type of animal skin, a substance that was preferred by some scholars at the time. In all, Gutenberg printed about 150 copies, of which approximately 21 still exist today. They are of course priceless. 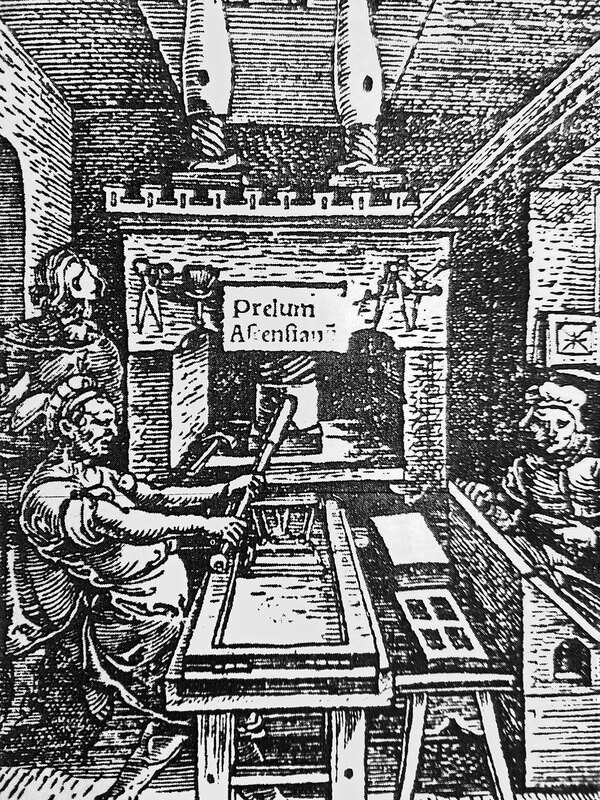 Nothing had more impact on the Italian Renaissance than the printing press. By the year 1500, printing presses were in more than 250 European towns, and more than 40,000 titles had already been published. Many towns now had more than one press. At this time, more than 9 million copies of the Bible had been printed. Books were now cheaper than ever, and access had never been greater. Now, people had access to classic literature, law books, astrology handbooks, romance novels, and grammar books. Before this time spelling didn't matter. For centuries students had spent their class time listening to teachers read to them from textbooks. Now students could read their own books and make their own interpretation of the authors intent. The printing press would change the world forever.